It’s official: Creativity Rulez is turning 4 today! I’m always amazed when I think about how long I have actually been doing this. Anyway, it’s high time for a look at the last blogging year to see what has happened. I know I keep saying this about my months, but August and September have been extremely stressful again, both at work and in my personal life. Especially September. August was a little more quiet at first but got stressful toward the end. I hate how little time I have for the things I would really like to do, especially how little energy I have left after a long day of work or doing my chores. On top of everything, I’m still busy preparing my courses. I’m teaching an introduction to psychology this semester and the research for that is really extensive. I’ll think twice next time before I take on something so research intensive as this one. I already started preparing in July, right after the previous semester finished. I still have so much left to do with only one month to go. I’m really starting to panic a little. After somewhat of a creative hiatus in December and January, I used my 2-week vacation in February to get back on track and back into writing on a more regular basis. I hadn’t even realized before how much I needed this downtime away from a busy life and every-day obligations. It really helps to be someplace else to get your head free. Today’s the day—again! 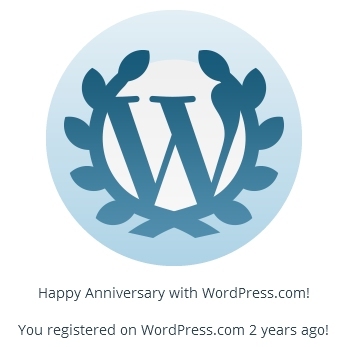 Two years ago my blog went online. Can you believe this? It really did not seem that long a time and on the other hand I feel like I’ve been doing this for ages. I like that WordPress gives you these little reminders. It is motivating to see what you have achieved. Last year, I used my blog’s anniversary as a chance to look back and ahead. Why not make this a little tradition? Around the turn of the year, while others were coming up with their New Year’s Resolutions, I was busy reflecting on my blog and brainstorming a list with post ideas and topics I’d like to write about in 2015. Some already went with a time plan when they should be published. For one clear insight and one resultant resolution came out of this reflecting process: In the past, more often than not, it took me way too long to write up seasonal posts (e.g and especially my Halloween posts). When they eventually did come out, the season was mostly already over, so the interest in those posts was understandably lower than it might have been. My second resolution for this new year, next to being more creative, therefore: I’d like to get to a point where I manage to upload seasonal posts during their respective season. WordPress just reminded me that I registered my blog exactly one year ago. Geez-Luise, that much time already? Seems like yesterday. My blog was nominated for the Liebster Award by charcoalblue on Monday. Thanks again! 🙂 I really like your blog as well. I wish I could draw 1/4 as good as you! Really cool. My first reaction to the nomination was: Cool! The second was: Liebster Award? What’s that?